I’m a little late to the mug cake game. This is mainly due to the fact that all of them I tried were wacky texturally; too dry, too wet, too tough, too spongy, too, um, weird and not cakey. 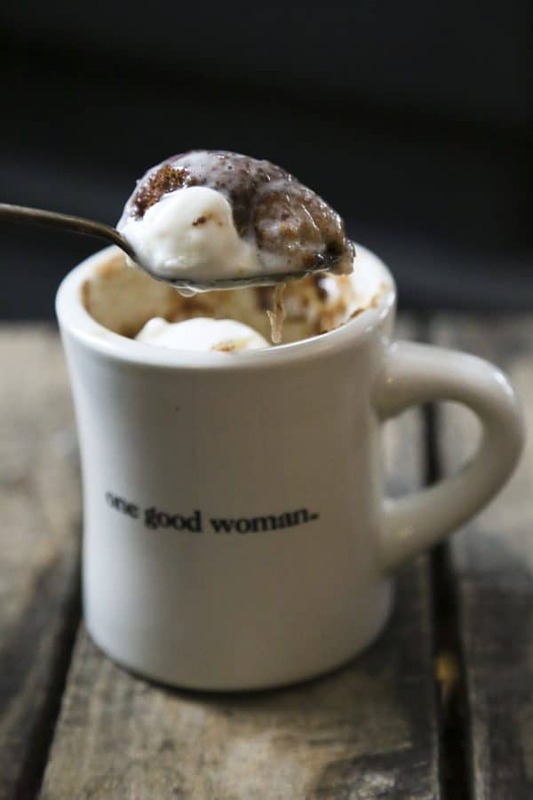 But then one night I got a hankering for something sweet and cinnamony -because that’s what I usually crave when it’s a sweets-emergency- and I decided to get down to business and really figure out how to make a mug cake that was worthy of the name ‘cake’. The boys selflessly offered to inhale eat all of my experiments, so the quest for a perfect mug cake was born. The result was a glorious Snickerdoodle Mug Cake. Moist, tender, fluffy, cinnamon and vanilla butter cake with a signature cinnamon sugar crust that was serious cake, not just ‘mug cake’. I nailed it, folks. 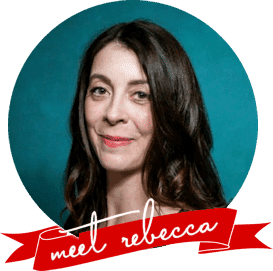 But I wanted to be sure that it worked in a variety of microwaves with a variety of cooks, so I set out with the what is probably the one and only time I’ve ever canvassed family and friends and asked them to produce an entire dish in the microwave. I could almost hear some of their jaws drop over the text waves. I even had ALL five of my sons make one individually because, honestly, if you want a good gauge as to whether the recipe is follow-able, ask a child to do it. All of them turned out a tasty cake with varying degrees of adhering to the recipe, and so, I bring you the Snickerdoodle Mug Cake. The best part of it all is that even if you’re stuck indoors due to inclement weather, chances are good you have all the ingredients on hand. Warm cake on a whim for one with a scoop of cold vanilla ice cream on it? Yeah. All that’s left for a perfect evening is a good book and a blanket. This cake does not work very well with the gluten-free blends my friends and family used to test it. I’m sorry, GF friends, but this one just doesn’t translate well. You are not reading it wrong, there is no egg in the recipe. I love the texture without it. I found that adding egg to the mix made the Snickerdoodle Mug Cake a VERY spongy, weird texture. The recipe calls for buttermilk because that’s what I like best for cakes. I think it does beautiful things for the finished crumb of the cake and this one -as quick cooking as it is- is no exception. If you don’t have buttermilk on hand, though, you can always do the vinegar/whole milk trick for a reasonable approximation. My friend Mary was kind enough to test that for me and she said it worked well. 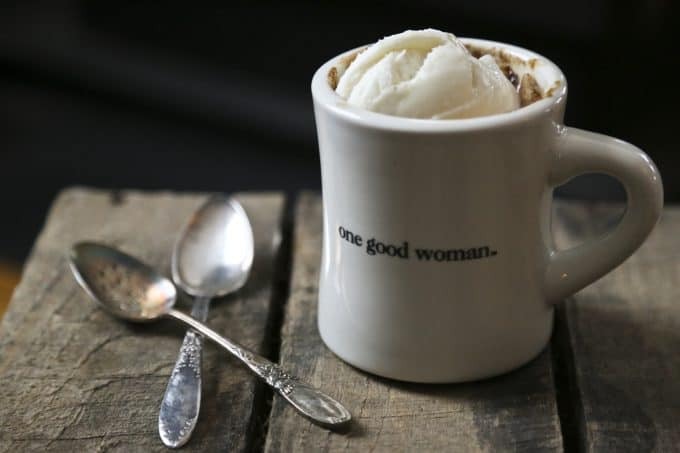 Likewise, my friend Sarah tried some vegan alterations to the Snickerdoodle Mug Cake, using Earth Balance in place of the butter and almond milk for the dairy milk. She liked the cake, too, but thought it would benefit from a scoop of vegan ice cream on top to which I say “YES PLEASE!” I promptly made another cake and did just that with vanilla frozen yogurt. It was glorious. One of my kids tested it with canola oil vs. butter. It was good. The buttery cake was better, but if you’re in a pinch and need a cake and don’t want to run to the store, this’ll work out. 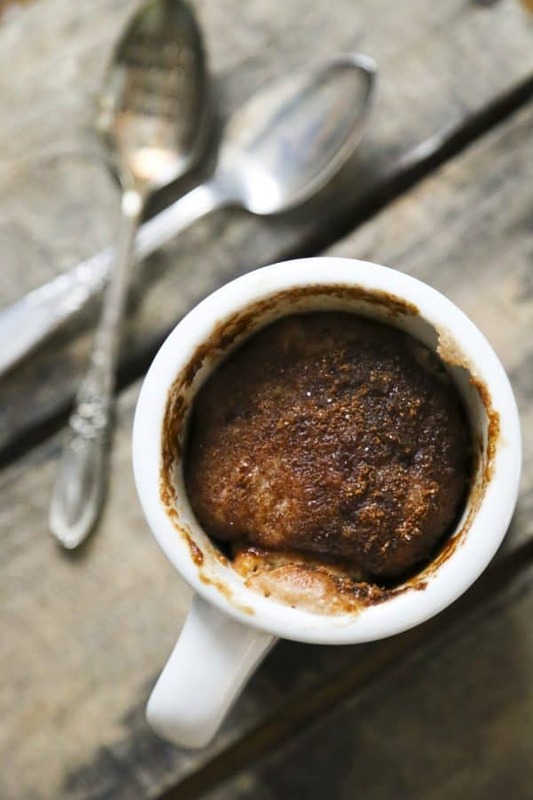 The Snickerdoodle Mug Cake was tested in a variety of microwaves with a range of powers from 900 to 1400 watts. All of them worked well. Keep in mind that most microwaves (like most ovens) are a little quirky and have individual traits. You may need to tinker with the timing by a few seconds one way or the other. Any way you nuke it, though, you’ll have cake. It may seem a little weird to microwave the buttermilk and butter together, but I like this for a couple of reasons. First, I tried it with melted butter and refrigerator-temp buttermilk. The butter seized in the buttermilk (duh) which made the cake less predictably textured. A microwave mug cake is not the time to practice your creaming butter with sugar and alternating liquids skills, so I short-cutted the process by heating the buttermilk and butter together until the butter melted. Problem solved. Ideally, your butter will be at room temperature before plunking into the buttermilk for microwaving. This makes the buttermilk a lower temperature when the butter is fully melted, but it’s not STRICTLY necessary. Emergency cake waits for no butter. My kids unintentionally tested stirring all the ingredients together in the mug itself vs. the bowl. The texture didn’t seem to suffer for it, but I’m a little obsessive about making sure I don’t have dry pockets of flour in cake batter, so I still prefer to stir it in a bowl. Mug size choice is key. Whatever you do, don’t go with a mug that holds less than 10 ounces of liquid. The ideal mug has a wide opening. You don’t want to ‘throttle’ the cake (which WILL expand) and make a cake-volcano by using a mug with a smaller opening. Besides Cake Vesuvius, if you choose a small opening mug, you’ll be looking at a cake with a stranger texture. I’ve tested it. Trust me. My assumption is that it has something to do with how easily liquid can evaporate from the respective mugs, but a scientist I ain’t, so that’s strictly conjecture. I have a perpetual jar of cinnamon sugar in my house. This is what I sprinkle over the cake before it goes into the microwave. If you don’t have the same jar-o-joy floating around your kitchen, you can make your own by whisking a generous tablespoon of ground cinnamon into 1/2 cup of granulated or raw sugar. Voila. Cinnamon sugar. Just keep this tightly lidded at room temperature in perpetuity and refill as needed. This recipe produces moist, tender, fluffy, cinnamon and vanilla butter cake with a signature cinnamon sugar crust. After biting it, you may think, "This is serious cake, not just 'mug cake'." Measure the buttermilk into a microwave safe container, add butter, and microwave on HIGH until the butter is melted into the buttermilk. Remove from the microwave, stir in the vanilla extract and set aside. Whisk the flour, sugar, cinnamon, baking powder, and kosher salt together (or use a fork to combine) in a small bowl. Add the buttermilk mixture and use a fork or small whisk to combine just until smooth. Scrape into a microwave safe mug, sprinkle with the cinnamon sugar, and microwave on HIGH for 2 minutes 10 seconds. This is best eaten warm. This looks amazing! I love the fact that you have tried it out different ways to anticipate what people will experience when making it! Can’t wait to try this one! I love you and hate you right now. (But mostly love.) This is just too good. AND easy. Too easy. My kids are going to go crazy for this. My oldest LOVES snickerdoodle anything. I’m both sorry and not sorry because I’m like your eldest. Snickerdoodle ALL the THINGS! I came in after hiking around in the snow yesterday and whipped one up and then sat down with a book (AT TWO IN THE AFTERNOON) and polished both off. Best Sunday activity ever. I have had this container of cinnamon sugar that didn’t fit in my shaker on the counter and been pondering the meaning of this. Asked and answered. Mug cake it is! Yes! 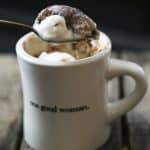 Happy Mug Cake Monday! 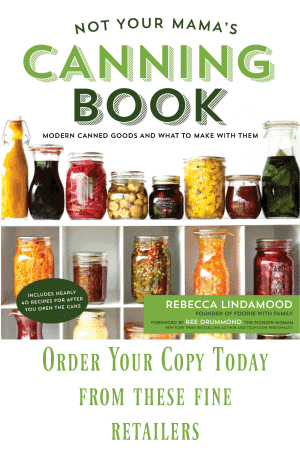 I’m thinking this would work just as well in a canning jar? We have more of those than mugs. Yeah, this is being made tonight! Actually I think I’ll whip up a bunch this afternoon, and have them ready for the kids. I’m glad someone decided to perfect the mug cake, because I got the same resuults with other variations that I just didn’t care for. Fantastic! This is my kind of after school treat! This is fantastic. I love that you had so many people test it out. And I will absolutely keep this in the back of my mind for random sweets cravings – I don’t have nearly enough quick remedies for those! I’m so excited to try this! One quick question…am I reading a full tablespoon of vanilla extract correctly? -Took five minutes from ‘start measuring’ to ‘finish eating’. False advertisement. Notify witty blogger. -Also, ice cream is essential to prevent utter destruction of inside of mouth from inhaling scorching deliciousness. P.S. One full teaspoon of extract was great and added perfect flavor balance to the smaller amount of sugar, which is easily half of what other recipes call for, something I was glad to see. Just made this, it was really yummy! I had to “taste test” it, so I can now make it for my sons when they are home on spring break. I tried this last night and My O My – it was delicious. I like the fact that you don’t need an egg for it especially for the times at the end of the month when one is running out of supplies. My mouth started watering even as I was mixing it. The research that you put into putting the recipe together is amazing – reminds me of myself at times when experimenting in the kitchen. I have a small band of guinea pigs aka my friends who are always willing to try my experiments. Thank you, Thank you for the recipe. Thank you, Glynis!! I’m so glad you liked it so much! ♥ And I love that it’s egg-free because my chickens had ratched back on egg production over our long cold winter! It was delicious,thank you for the recipe!! I’m nursing my burnt tongue and waiting in the rest to cool before I dig back in. This cake is so very fluffy!! Just enough sweetness. I’m so glad you perfected this because you are right that an egg just messes up the recipe. Thank you thank you thank you, from the world’s worst sweet-tooth. 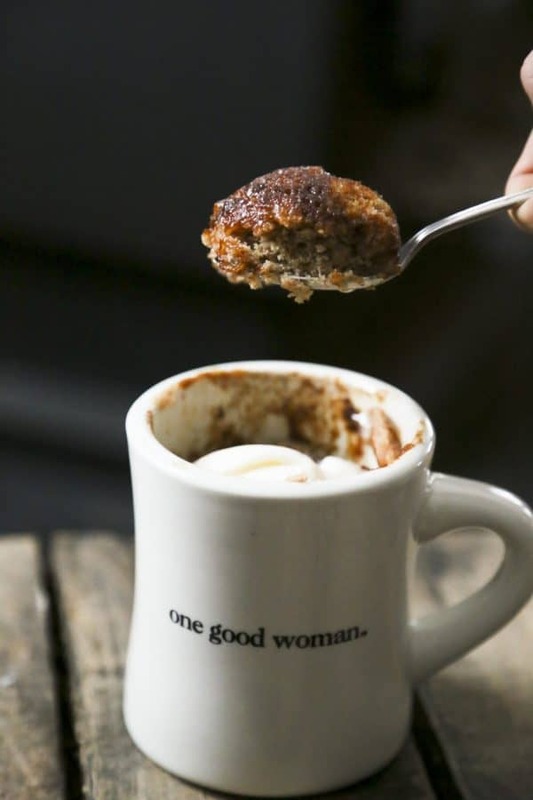 Really enjoyed this warm gooey mug cake. I cooked it in a pint ball jar and added one mashed banana to mixture. Tastes like banana bread when done. Thank you! Just want to double check that it’s supposed to be a Tablesppon of vanilla. I usually see vanilla in much smaller amounts, so just checking. I made this today, but enough to share. Very good. Came on demand.. What could be better!!! !